The New York City AIDS Memorial’s Board of Directors revealed new renderings of the final design for the memorial and formally launched their capital campaign Wednesday in Manhattan. 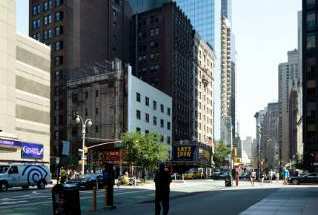 The effort to build the memorial, which started in 2011 as a grass-roots advocacy campaign led by two young men, Christopher Tepper and Paul Kelterborn, will feature an 18-foot steel canopy as the gateway to the new St. Vincent’s Hospital Park at the intersection of West 12th Street and Greenwich Avenue in the West Village neighborhood. The memorial also will feature a central granite fountain, granite benches and a granite paving surface carved with educational and commemorative text. The text will be curated by a team of historians, artists, community members and activists led by Pulitzer Prize and Tony Award-winning playwright Tony Kushner. The private funding has come from gifts across the LGBT and AIDS communities, including lead gift of $250,000 from the Arcus Foundation, and a $105,000 grant from Broadway Cares/Equity Fights AIDS. 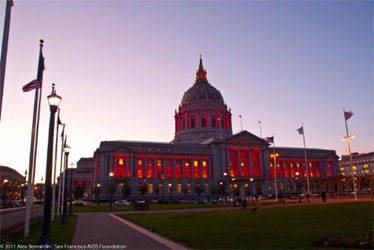 Nearly 500 architects from around the world submitted designs for the memorial during an ideas competition in late 2011, sponsored by Architectural Record and Architizer and displayed at the AIA’s Center for Architecture. The jury, led by Michael Arad, designer of the National September 11th Memorial, selected a winning design by Brooklyn-based architectural firm studio a+i. 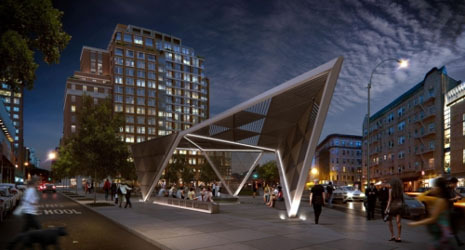 After the New York City Council designated a site for the memorial in March 2012, the NYC AIDS Memorial organization continued to work with the original team of architects to create the new design. The AIDS Memorial Park Coalition was founded in 2011 by urban planners Christopher Tepper and Paul Kelterborn to recognize and preserve the history of the AIDS crisis through the creation of a memorial to honor New York City’s 100,000+ men, women and children who have died from AIDS.